The Rally Fighter was also featured on the Discovery Channel television show ‘Game Changers’ showing the build process that customers who purchase a Rally Fighter would go through. The Rally Fighter is an automobile built by the customer at a Micro Factory owned and operated by Local Motors. The Peel P50 is a three-wheeled microcar originally manufactured from 1962 to 1965 by the Peel Engineering Company on the Isle of Man in the Irish Sea. It currently holds the record for the smallest automobile to go into production. It has no reverse gear, but a handle at the rear allows the very lightweight car to be physically maneuvered when required. Designed as a city car, it was advertised as capable of seating ‘one adult and a shopping bag.’ The vehicle’s only door was on its left side, and equipment included a single windscreen wiper and only one headlight. Standard colors were Daytona White, Dragon Red, and Dark Blue. The 1963 model retailed for £199 when new. 50 of them were produced, and only 27 of them are known to be still in existence. The DeltaWing is a racing car designed by Ben Bowlby that debuted at the 2012 24 Hours of Le Mans. The entry will run under the Project 56 name, composed of Ben Bowlby’s DeltaWing Racing Cars (design), Dan Gurney’s All American Racers (constructor), Duncan Dayton’s Highcroft Racing (racing team) and International Motor Sports Association owner Don Panoz (advisor). Nissan’s NISMO division is also assisting in the development of the car. The Amitron was an electric concept car built in 1967 by American Motors Corporation (AMC) and Gulton Industries of Metuchen, New Jersey. It was a snub-snouted three-passenger urban area vehicle or city car with an overall length of only 85 inches. The Beatnik Bandit is a custom car created in 1961 by ‘Big Daddy’ Ed Roth, originally as a project for ‘Rod & Custom magazine’; instead of a steering wheel, it was controlled by a joystick. A Hot Wheels car was made based on the Beatnik Bandit. 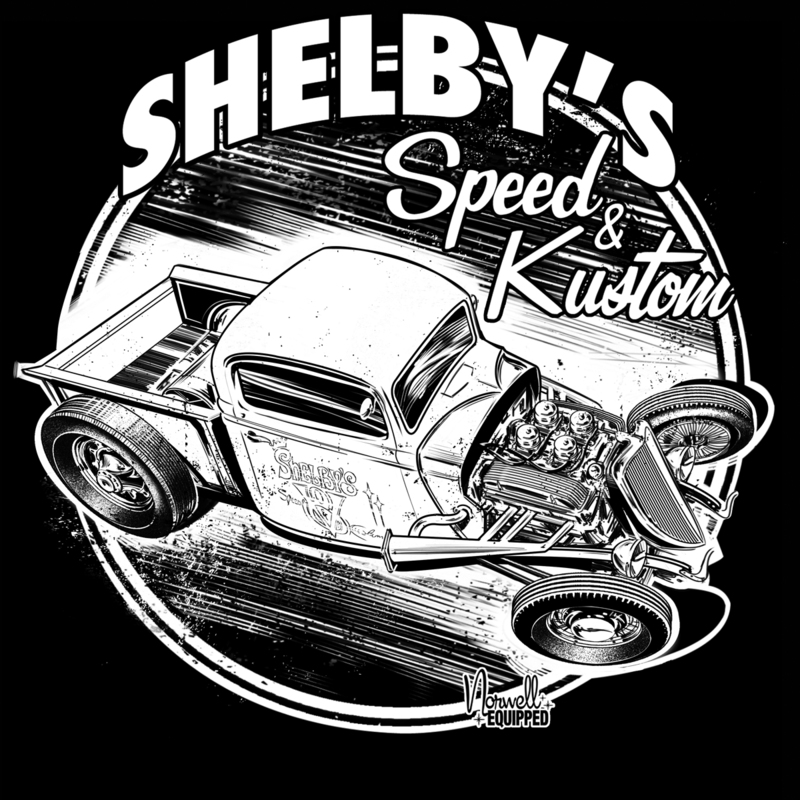 The car is a representation of ‘Kustom Kulture,’ a neologism used to describe the oeuvre of those who drove and built custom cars and motorcycles in the US from the 1950s through today. The Nissan NV200 is a light commercial vehicle first shown as a concept car at the 2007 Tokyo Motor Show. Though it is an alternative to the Nissan Vanette, it is only available as a van model. ‘NV’ stands for New generation Vehicle, or sometimes ‘New Vanette’ by fans. It was launched in Japan in 2009. The NV200 was one of three finalists (alongside the Karsan V-1 and Ford Transit Connect) for New York City’s Taxi of Tomorrow competition. The Nissan was announced as the winner in 2011 and is expected to be awarded a 10-year contract to provide the city exclusively with some 13,000 yellow cabs, starting in 2013. A fully electric version of the Nissan NV200 may be available by 2017 for the NYC Taxi fleet. 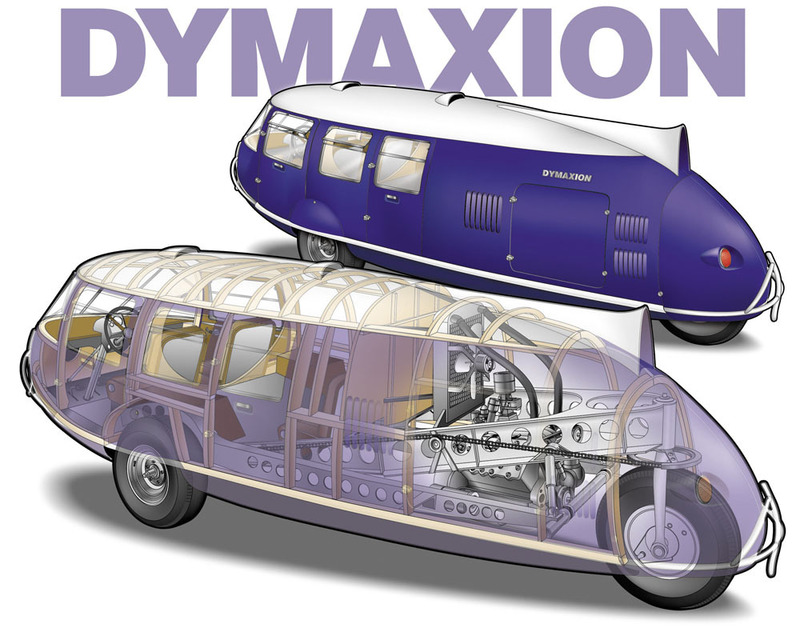 The Dymaxion [dahy-mak-see-uhn] car was a concept car designed by U.S. inventor and architect Buckminster Fuller in 1933. The word Dymaxion is a brand name that Fuller gave to several of his inventions, to emphasize that he considered them part of a more general project to improve humanity’s living conditions. The car had a fuel efficiency of 30 mpg, and could transport 11 passengers. While Fuller claimed it could reach speeds of 120 miles per hour, the fastest documented speed was 90 miles per hour. Japanese American artist Isamu Noguchi was involved with the development of the Dymaxion car, creating plaster wind tunnel models that were a factor in determining its shape, and during 1934 drove it for an extended road trip through Connecticut with congresswoman Clare Boothe Luce and actress Dorothy Hale. A jalopy [juh-lop-ee] (also clunker or hooptie or beater) is a decrepit car, often old and in a barely functional state. A jalopy is not a well kept antique car, but a car which is mostly rundown or beaten up. As a slang term in American English, ‘jalopy’ was noted in 1924 but is now slightly passé. The term was used extensively in the book ‘On the Road’ by Jack Kerouac, first published in 1957, although written from 1947. The equivalent English term is old banger, often shortened to banger, a reference to older poorly maintained vehicles’ tendency to backfire. Kustoms are modified cars from the 1930s to the early 1960s, done in the customizing styles of that time period. The usage of a ‘K’ rather than a ‘C,’ is believed to have originated with car designer George Barris. This style generally consists of, but it not limited to starting with a 2-door coupe; lowering the suspension; chopping down the roof line (usually chopped more in the rear to give a ‘raked back’ look, with B-pillars also commonly leaned to enhance this look); sectioning and/or channeling the body (removing a section from the center); certain pieces of side trim are usually removed or ‘shaved’ to make the car look longer, lower and smoother; often bits and pieces of trim from other model cars, are cut, spliced and added to give the car a totally new and interesting ‘line’ to lead the eye in the direction that the Kustomizer wishes it to go; door handles are also ‘shaved’ as well (electric solenoids or cables are installed); buttons are installed in hidden locations and used to open the doors; trunk lids and other pieces of the body can also be altered in this matter. A sleeper (called a Q-car in the UK) is a car that has high performance and an unassuming exterior. Sleeper cars are termed such because their exterior looks little or no different from a standard or economy-class car. In some cases the car appears worse due to seeming neglect on the owner’s part, typically referred to as ‘all go and no show.’ While appearing to be a standard or neglected car, internally they are modified to perform at higher performance levels. The American nomenclature comes from the term sleeper agent, while the British term derives from the Q-ships used by the Royal Navy. American actor Paul Newman famously drove a 1963 VW Beetle convertible with a 300-horsepower engine, racing suspension and five-speed gearbox. The back seats were removed to make room for the 351-cubic-inch Ford engine. General Motors EN-V (Electric Networked-Vehicle) is a 2-seat urban electric concept car developed by GM that can be driven normally or operated autonomously. Designed for urban environments and around an extrapolation of the P.U.M.A. prototype announced in 2009 by GM and Segway, which contributed the two-wheeled balancing system. Three different vehicles are showcased, Xiao (Laugh), Jiao (Pride) and Miao (Magic). The EN-V can detect and avoid obstacles–including other vehicles–park themselves and will come when called by phone. Accomplished through a combination of GPS, vehicle-based sensors and vehicle-to-vehicle communication. This autonomous technology is an extrapolation of that found in GM’s 2007 autonomous ‘The Boss’ Chevrolet Tahoe created for the DARPA Grand Challenge (2007). The EN-Vs can communicate with each other allowing platooning, with one or more EN-Vs tagging along automatically behind a leader. 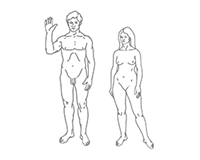 Also, if an EN-V detects another in close proximity, it can check what that other is intending to do and agree on how to pass it safely. 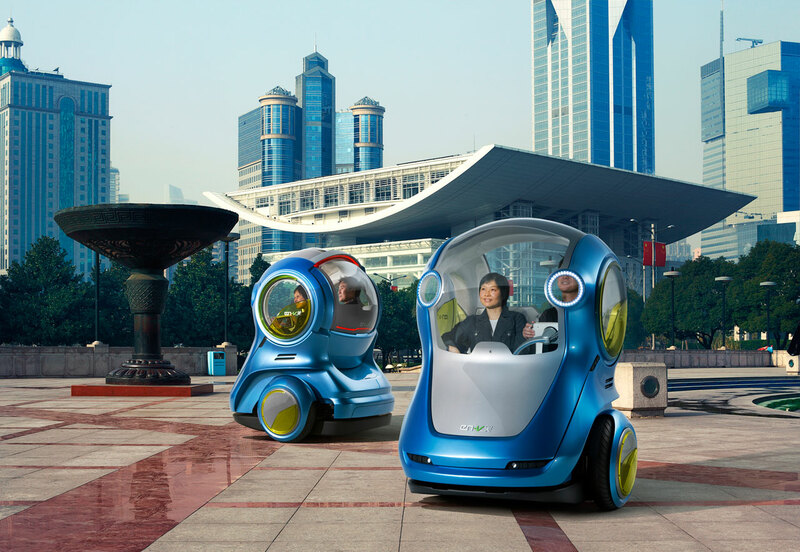 Powered by two electric motors, one on each wheel, and a lithium-ion phosphate battery, the EN-V has a top speed of 40 kilometers per hour (25 mph) and a maximum all-electric range of 40 kilometers (25 mi). 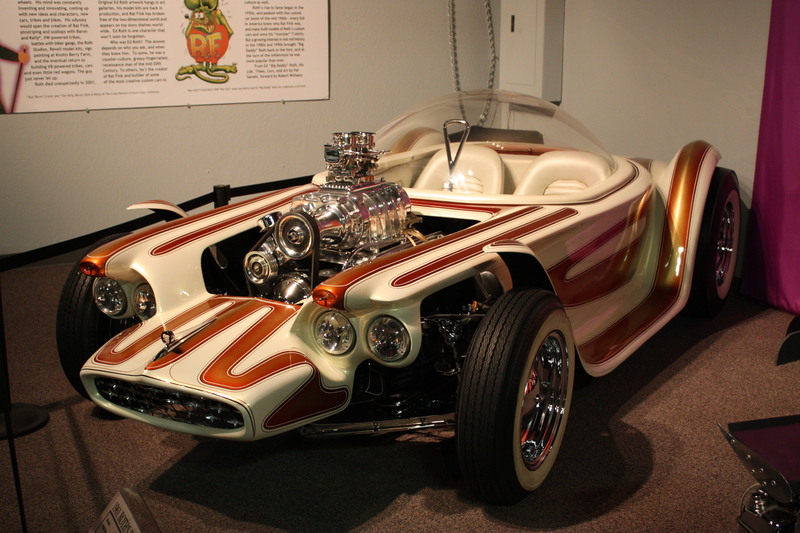 The Orbitron is a custom car built by Ed Roth and feared lost until its rediscovery in Mexico in 2007. Built in 1964, the vehicle was powered by a 1955 or 1956 Chevrolet V8 and was backed by a Powerglide automatic transmission. The body was hand-laid fiberglass which actually hid Roth’s extensive chrome work to the chassis. The cockpit, set at the extreme rear of the vehicle in the manner of a dragster, was lined with fake fur and featured a General Electric portable television inserted in the console. 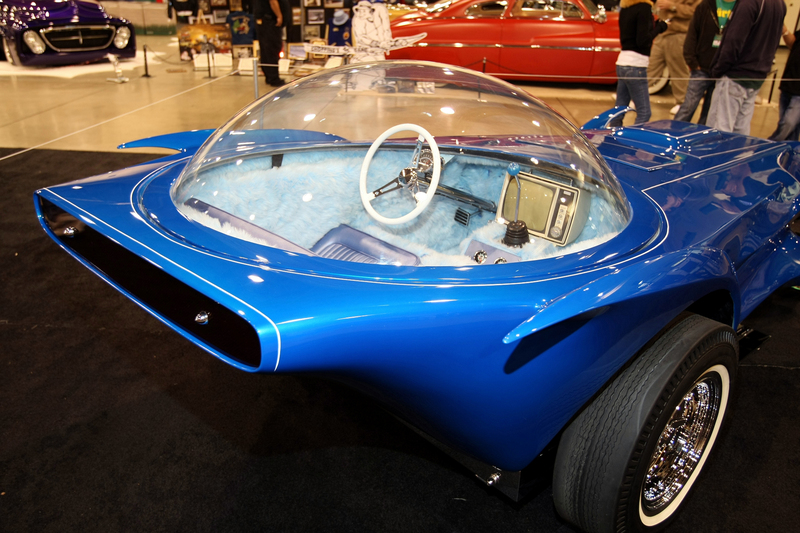 Topping the cockpit was a custom-made, hydraulically operated plexiglass bubble top. One of a series of ordinary doorbell switches atop the hood activated the top from the outside.